Dickerson was subjected to years of ridicule for his weight. So last summer he lost 20 pounds and had a breakthrough season, culminating with his selection as first-team All-Pac-12. As much as Noah Dickerson tried to pretend otherwise, the fat jokes hurt. For years the Washington junior forward was the object of ridicule from people who teased him about his weight. Dickerson heard it from Husky fans on Twitter, teammates in the locker room and coaches at practice. Even his twin brother Jordan would poke fun at him. “He still does it,” Dickerson said, smiling. “You’re not supposed to let stuff like that affect you, but when you hear it all the time, it affects you. It hurts. This is one of those stories with a happy ending. It’s a tale about a young man’s battle with the bulge and how Dickerson overcame the one thing preventing him from realizing his potential: himself. “I’m happy with where I’m at now, but man, it was a long road to get here,” said Dickerson, who credits losing 20 pounds last summer for his breakthrough season. “I hated being called fat. I knew I wasn’t fat. I was big and I was chunky. I wasn’t fat, and I got tired of people saying that about me. Last week, Dickerson was voted first-team All-Pac-12 by conference coaches and on Tuesday he was selected to the National Association of Basketball Coaches (NABC) All-District 20 second team. Realistically, the Huskies (20-12) don’t make an 11-game improvement from last season without Dickerson, who has been arguably their most valuable player while averaging 15.4 points and 8.4 rebounds. 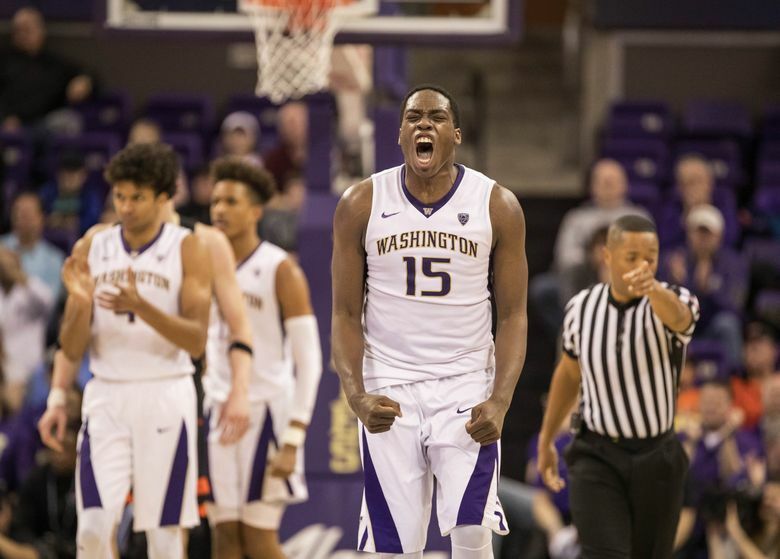 “For a coach to see somebody’s dream come true, that’s the fun part of this job,” said coach Mike Hopkins before Washington’s first-round National Invitation Tournament game against Boise State (23-8) on Wednesday at Alaska Airlines Arena. According to research released in October by the National Center of Statistics, nearly 40 percent of adults and 19 percent of youth are obese. Dickerson, a two-sport standout in high school, said his football coaches often encouraged him to gain weight when he was an adolescent. In basketball, the 6-foot-8 forward became a four-star recruit at Montverde Academy (Fla.) who verbally committed to Georgia and signed with Florida before joining the Huskies in 2015. 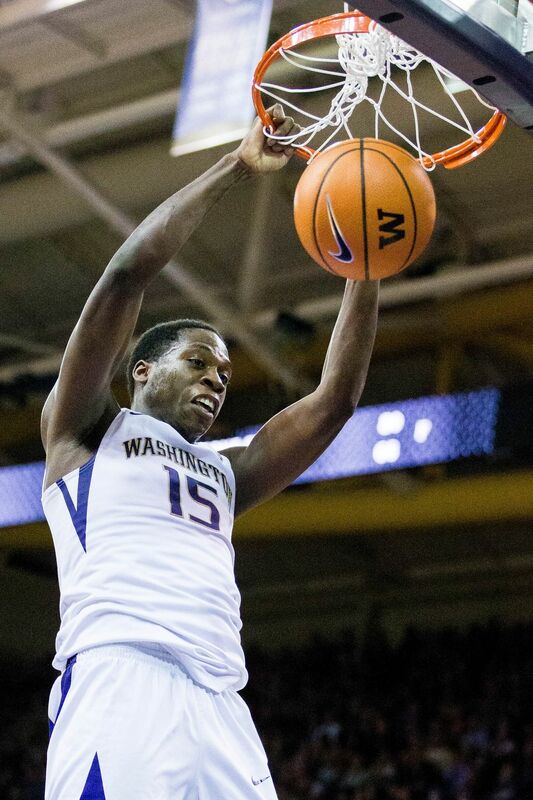 Dickerson, a three-year UW starter, averaged 7.5 points and 5.2 rebounds as a freshman. He made steady improvement as sophomore, when he averaged 12.5 points and 8.2 rebounds. However, he was listed at 255 pounds, and the weight was holding him back on the court. “We had a running joke, and guys on the team called Noah fat boy,” junior guard Matisse Thybulle said. “There were days where me and him almost fought because he wasn’t going that hard in practice and I called him fat. Dickerson credits UW’s strength and conditioning coach, Todd Tuetken, and assistant Cameron Dollar for keeping him honest with a rigorous workout plan that included lots of running and lifting weights during the offseason. The workout regimen and cutting back on Domino’s pizza helped Dickerson drop from 267 pounds last summer to 245. “I remember one year we were at (UW) media day he was just constantly messing with his jersey because it was too tight around his waist,” Thybulle said. “He went from that to us looking at him at media day this year and being like, ‘Is that muscles we see?’ We saw him every day over the summer, but when he put on that jersey he looked like a different person. He’s come a long ways. Following a 21-point, 16-rebound performance against Arizona State and a 25-point outing versus Arizona, Dickerson was named the NCAA and Pac-12 player of the week. He tallied 10 double-doubles this season, which is twice as many as he had coming into the year. Dickerson has also raised his shooting percentages from the field (56.5) and free-throw line (78.6). “I used to see some crazy tweets about me after bad games,” Dickerson said. “But I don’t see them too much any more.